BSTRA has been selected as an awardee for DCR’s FY 2108 Partnership Matching Funds Program. BSTRA proposes to advance the final stages of design and permitting for this section of the SNETT between Rt 126 and Center Street in Bellingham. DCR has completed preliminary alignment, typical sections and profile (see attached), however, MHC permitting, wetland permitting, wetland replication design, trail amenities and final design are still needed. Towards this end, BSTRA has contributed $10,000 with DCR matching this amount with $20,000. 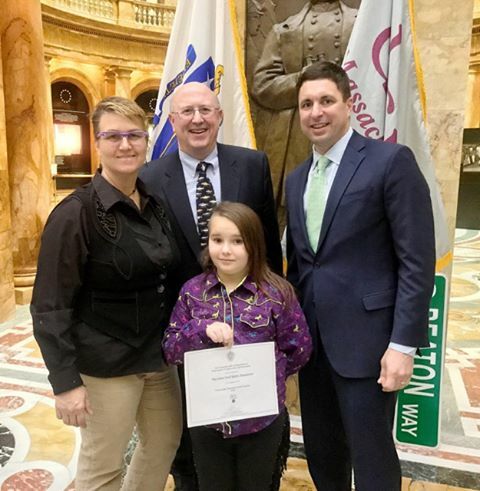 We want to thank Michelle & Scout Murphy for making the trip to the state house and accepting the award on behalf of BSTRA!